A couple years ago, I was dating a young man whose mom had a gluten allergy. I really wanted to make something to bring when I met her, but this was my first encounter with gluten free baking. I decided upon a flourless chocolate cake because you can make it with black beans or chickpeas to make it gluten-free. It turned out delicious! No one even knew there were beans in the cake because you couldn’t taste it. 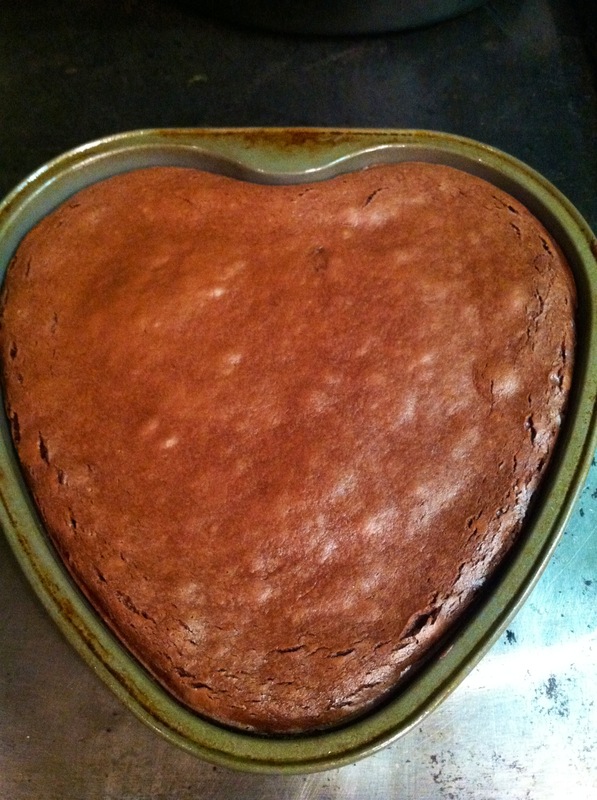 Fast forward to earlier today, I really wanted to make this cake again for Valentine’s Day, but I also wanted to make it vegan. By substituting silken tofu for eggs, I was able to make this delicious flourless chocolate cake not only gluten-free but also vegan. This vegan, gluten-free flourless chocolate cake is so moist and has such a great smooth texture. It’s also quite rich in flavor. The flavor from the chickpeas and the tofu is very subtle, which allows the flavor of the chocolate to really come through. Additionally, one slice of this vegan, gluten-free flourless chocolate cake provides you with 2.9 grams of protein and 3.8 grams of dietary fiber as well as some potassium and other vitamins and minerals, which is pretty good for a dessert since that’s not where you’re looking to get your vitamins and minerals anyway! Start by preheating your oven to 350 degrees Fahrenheit or 175 degrees Celcius. Then you’ll need to get out your Vitamix or food processor to make this recipe. What will need to go into your Vitamix or food processor first are the garbanzo beans, silken tofu, and the vanilla extract. If using canned garbanzo beans, make sure you rinse and drain them very well before adding in. If not, you will need two cups of cooked garbanzo beans. For the silken tofu, you’ll be putting one cup, about half of the package, into your Vitamix or food processor. Add in your one teaspoon of vanilla extract, and then process this for a minute or two. Next add in your 1/2 teaspoon of baking powder and your 3/4 cup of light brown sugar. You can also use white sugar, but I prefer brown sugar personally. Process this for another minute or two. Now you’ll need to make a double boiler to melt your chocolate. If you don’t have a double boiler, you can easily make one by taking a pot and filling it up with water about 1/4 of the way. Then set a mixing bowl on top of the pot. You’ll want to bring the water to a boil and then add your chocolate chips to the mixing bowl on top. Stir your chocolate while it melts until it is all melted and has a nice, smooth consistency. Then add your melted chocolate to your Vitamix or food processor. Process on high for another couple minutes, until you have achieved a smooth, consistent texture. Next pour your vegan, gluten-free flourless chocolate cake batter into your prepared baking pan. 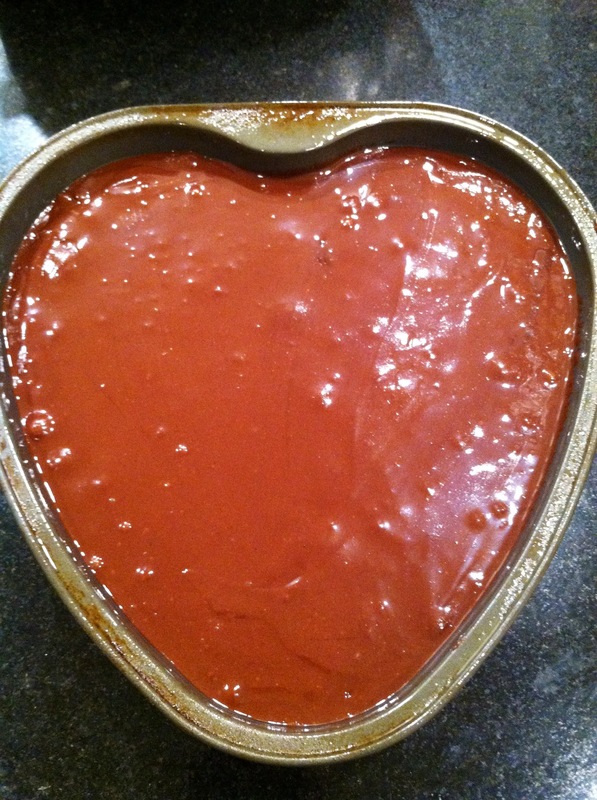 I used a 8″ heart tin, which I thought was appropriate for Valentine’s Day! Bake in the oven for about 40 minutes, or until a toothpick comes out clean. Let cool for about 20 minutes. Place your flourless chocolate cake in the fridge to cool for at least an hour before serving. The longer you allow your cake to chill, the more it will “set” and become a dense flourless chocolate cake. 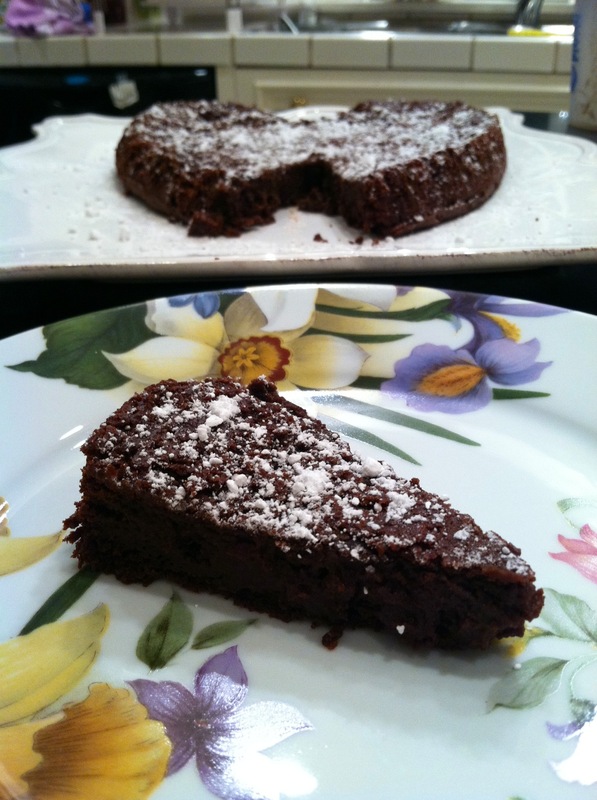 When ready to serve, dust your flourless chocolate cake with either confectioner’s sugar or cocoa. 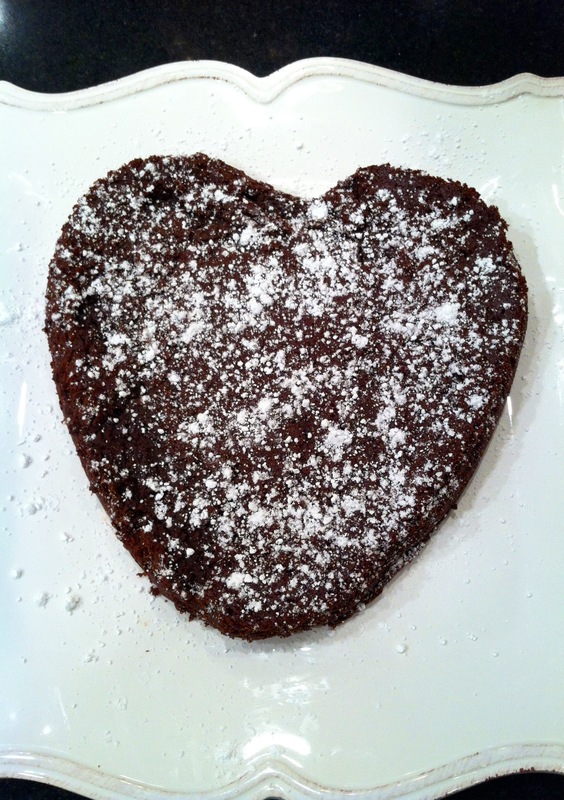 Enjoy your vegan, gluten-free flourless chocolate cake! 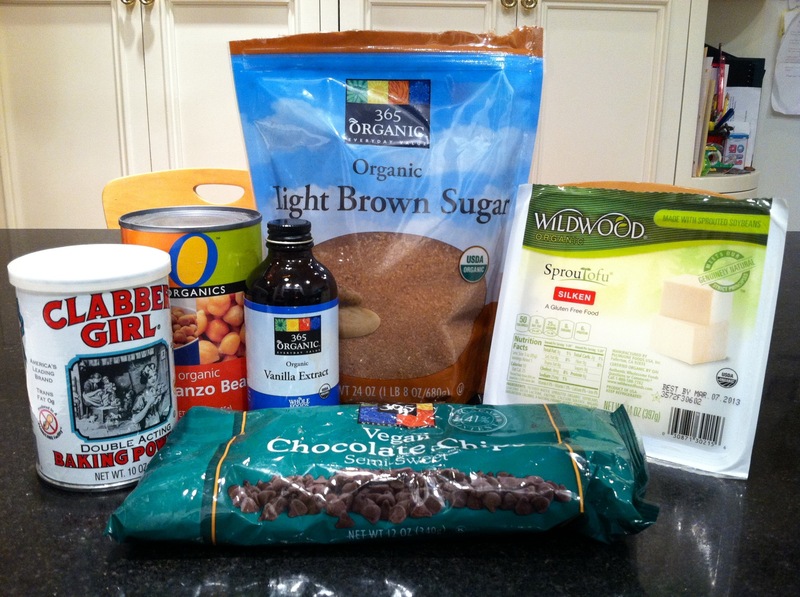 I am basing the nutritional facts on 12 equal slices of this vegan and gluten-free flourless chocolate cake. This is the way I ended up cutting this cake, and these seemed like well-portioned slices. One slice of this cake will give you 233 calories and 10 grams of fat. It will also give you 134 milligrams of your daily potassium and almost 3 grams of protein. This vegan, gluten-free flourless chocolate cake will also give you 39 grams of your total carbohydrates, almost 4 grams being dietary fiber. In terms of vitamins, you’ll be receiving 2% of your daily vitamin C and 9% of your daily vitamin B-6. In terms of minerals, you’ll be receiving 5% of your phosphorous, 6% of your copper, 6% of your folate and 13% of your daily manganese.